Come along on a guided tour of WinSplits Pro! This tour will give you an overview of the program's contents with the help of screen shots, diagrams, and text. 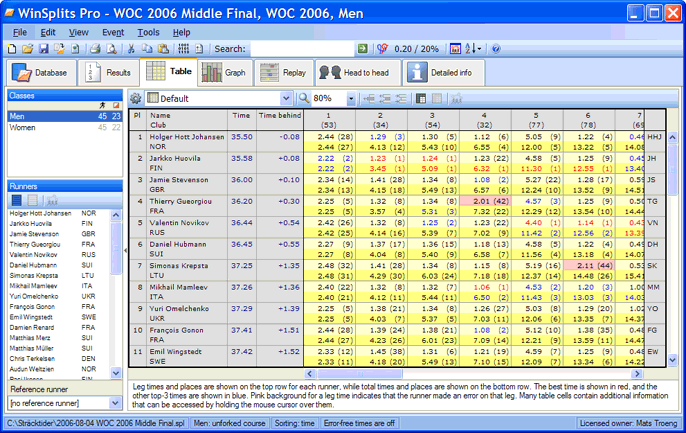 The split times that are shown come from the men's middle distance final from WOC in Denmark, 2006. What can one do in WinSplits Pro? As you can see from the list below, a whole lot! Look at results and splits from thousands of orienteering competitions from around the world. Upload data from your own club training races. Sort your clubmates by their times per kilometer. Select just several legs (for example, those after the spectator control or only short legs) and see a split time list for them. Make a split time list for your class consisting only of your clubmates. See how much time you lost at each control, as well as over the whole course. Join classes running the same or similar courses to get a cross-class comparison. Figure out on how many legs, or on what percentage of the course you beat your greatest nemesis. Create a list of all the finish splits in the whole competition. See if you are fastest from the last control to the finish! Find out which runners ran in packs and followed each other. Study which runners ran most consistently, which made the most mistakes, which followed the most, or which led the biggest pack. Display the amount of time the runners who followed earned by following. Sort your splits in performance order to see which were your best and worst legs. Import split files from html- or text- format, so that you can analyse the splits even from those races, whose organisers did not load splits into the WinSplits database. Edit individual split times, so you can even analyse the splits for races where you did not finish, mispunched or skipped a control. The program user interface is designed around a tab system with seven tabs that make it easy to navigate between the different parts of the program. 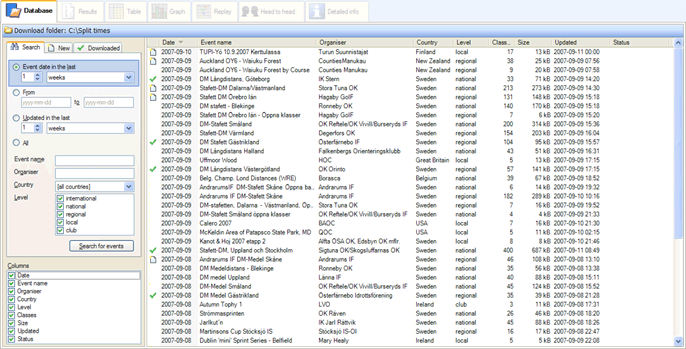 In the database tab, the user downloads competitions from the WinSplits database. You can search for competitions by parameters, such as date, competition name, and country in the Search tab. The tab New shows all the competitions that have appeared in the database since the last time WinSplits Pro was run. The tab Downloaded gives quick access to those competitions that have alreadey been downloaded and saved to the hard drive. Double-click on a competition, and WinSplits Pro will download and display the split times and results in a couple of seconds. The Results tab shows result lists from the current competition, both as class and club results. You can filter the lists to select certain runners, and sort the lists by clicking on a column name. Icons all the way on the right in the same row as the class name provide shortcuts that allow you to analyse that class' split times in one of the other modes of the program. Class results for the six best runners in each class.